The weather is supposed to be pretty rubbish today but its surprisingly nice out! I'm even feeling a bit better, I'm wearing something other than pj's which is defnately a step in the right direction! We've been out grocery shopping and I've done some housework. Feeling a little tired now so I think its time for a little rest so I thought it was the perfect time to sit and write a little blog post. 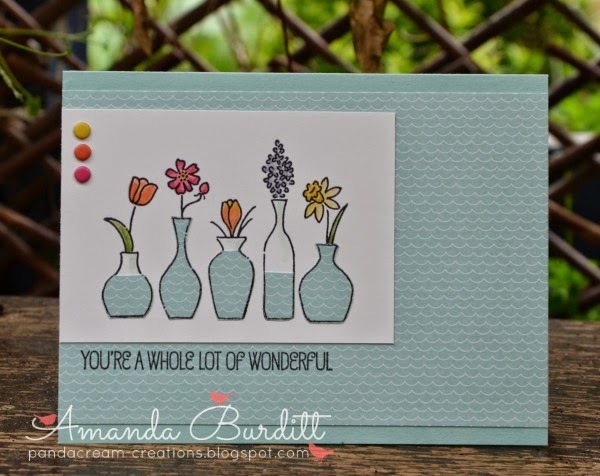 So, I am having so much fun playing with the Vivid Vases stamp at the moment! I love how it creates beautiful and simple cards! 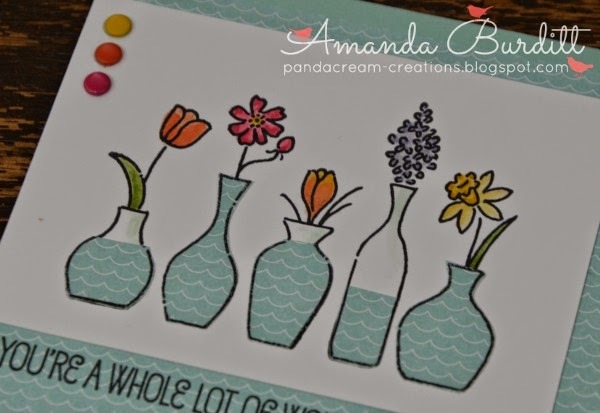 Just like the vases notecard I shared with you on Sunday, I used blender pens to colour in the flowers and vases. Aren't the bright colourful flowers just so cheerful? I stamped the whole stamp again on the pattern paper and then layered for white card over to cover up the vases - if you're feeling lazy and can't be bothered to mask of the stamp, this works just as well! I decided to use a technique I haven't done in ages called paper piecing. Its so simple and fun! Just ink up and stamp the vases on the pattern paper then cut around the vases, layer over the stamped vases on the white cardstock. The pattern paper looks like water in the vases so to add a little more interest and variation in height I cut down some of the patterned papers for the different water levels. I think it's really quite effective! I wanted to add some embellishments but I didn't think rhinestones or pearls would be appropriate. As I was enjoying the bright colours of the flowers I thought I'd pick up on the colours with the candy dots. I just added three in a little strip down the of the card. Simple and understated, but I just love the extra little pop of colour!